A carefully thought-through lighting scheme is essential to a bedroom design that is functional and attractive. Most bedrooms need a mixture of different types of lighting in order to accommodate dressing, reading, and relaxing, without overpowering the room with harsh light. Task lighting is a must for readers or those who like to use the bedroom as a home office. Ambient, low-level lighting such as dimmable overhead or bedside lamps will help fill your bedroom with soft, diffused light – perfect for winding down before drifting off to sleep. Wardrobes will benefit from spotlights, especially in larger rooms with insufficient natural light. 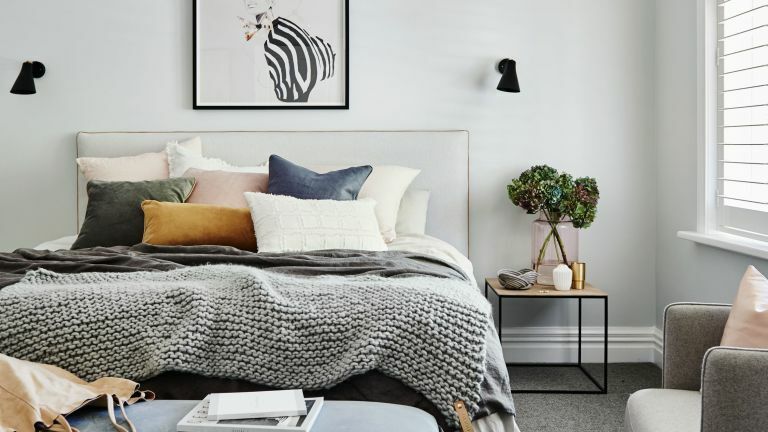 We consider all of the different bedroom lighting schemes, from accenting with spotlights to choosing a lampshade, and explain how to combine them to achieve the perfect bedroom lighting design scheme. Use our guide to planning bedroom lighting to get just the right mix in your room. Designing a bedroom from scratch? Have a read of our handy guide to how to design a bedroom (and then come back to ace your lighting scheme.) Use these lighting ideas for bedrooms to get inspired, too. What type of lighting do you need in a bedroom? Bedrooms, usually only used at night for any length of time, look their best when lit with low light. So, while you might rely on the typical three types of artificial lighting – ambient, task and accent – you may rarely use all three at once, unlike in a living room, for example. Ambient light: This mimics natural daylight and can be created with pendants, lamps and wall lights for soft pools of light and a relaxed atmosphere. Task light: This is a focused light, whether in the form of bright ceiling downlights, wardrobe lighting or a bedside table or reading lamp. Accent light: Created with spotlights, downlights and uplights, among other styles of lighting, this is especially used to highlight design features such as alcoves or artwork, but can also be created with table lamps to create zoned pools of light. The first thing to do when designing the lighting scheme for your bedroom is the amount of natural light that comes in. Then think about your needs and habits: are you much of a reader at night? Then you'll need to invest in good quality reading lights. Or do you mainly use your bedroom for evening lounging in on the weekends? In which case, you'll want some atmospheric, low level and dimmable lighting. Do you need good lighting in winter to find clothes or put on makeup? Then you'll need good ambient and task lighting. With a rough idea of the lighting effects you want to create planned out, you can think about how your lighting will be controlled – and this is where a bigger budget will come into play. No bedroom lighting scheme will look its best controlled by one switch – putting your bedroom lighting on different circuits is a must. An average bedroom will need at least two or three circuits: one for downlights or the central pendant; one for table lamps; and one for wall lights, for example. Ideally, you should be able to control all of the room's lighting from just by the bedroom door and from the bed. You'll probably rely on the central pendant in a bedroom less than you would on the one in the living room, so you can afford to think less practically and more decoratively. If your bedroom has high ceilings, a larger pendant shade or chandelier will create a pretty focal point, especially in traditional bedrooms; lower ceilings might benefit more from smaller fittings or, in contemporary bedrooms, downlights or ceiling lights. Love to read in bed? Bedside table lamps are an easy win but if yours is a small bedroom, save space with wall lights. They will give you enough light for both ambience, and reading if fitted close enough to the bed. Want to read, while your partner wants to sleep? The solution: a discreet reading spotlight, which can be either mounted on the wall or attached to the headboard – and a dimmer switch. Experiment with a torch from your reading position so that you site the light in just the right place – you want to avoid glare when you are lying down. Another option for bedside lighting is the dropped pendant or – in the case of this bedroom – a grouping of pendants. Perfect for a stylish hotel look, group these in odd numbers and a range of sizes for best effect. Spotlights or downlights are the best solution for areas of the bedroom that tend to be always dark, such as walk-in wardrobes and fitted bedroom storage units. If you have a freestanding wardrobe, you can use a clip-on or freestanding spotlight on top as an affordable option. Walk-in wardrobes and complex fitted solutions will need a professional lighting installation – many fitted furniture companies will sell and install the lighting as part of the package. Love the idea of a walk-in wardrobe? You'll be lusting over our walk-in wardrobe and dressing room ideas design guide. Contemporary bedrooms can look cool with task lights and spotlights, but a good lampshade cannot be beaten for providing soft, diffused glow, especially important in more traditional bedrooms. Choose the best quality lampshade you can afford, and pick an off-white or cream colour for maximum warmth. You can also warm up a cool bedroom (and save money) by choosing the right lightbulb. Tungsten bulbs produce a warm, instant light, last about 1,000 hours, get hot when lit and are fully dimmable. They are being phased out in favour of bulbs with greater energy efficiency. Halogen bulbs give off a bright, instant white light, last about 2,000 hours, become hot when lit and are fully dimmable. They also come in low-voltage capsule types for armed lighting, which may require specialist dimmers. Energy-saving bulbs, also known as compact fluorescent bulbs (CFL), give off a warm, white light, take around 60 seconds to warm up and last for 8,000 plus hours; they are not generally dimmable, although there are some versions available, which are not recommended for touch lamps. LED (Light Emitting Diode) bulbs last for more than 20,000 hours, give off a warm, white light, are cool to the touch and are as efficient as energy-saving bulbs. Dimmable versions are available, although they are not recommended for use with touch lamps. If you are designing a bedroom on a budget, dimmer switches are an inexpensive option and are great for changing the mood of a room. There are several types: a touch dimmer, controlled by touching the light or switch plate; a switch dimmer, turned on by adjusting a rotating or in-line switch on the lamp or switch plate by hand; and a remote dimmer, usually a wall plate with a remote control-operated touch-sensitive switch. This last type can be programmed to remember your ideal lighting levels. Dimmers can’t be used with energy-saving bulbs, but the dimming itself will usually save energy. Halogen bulbs can be dimmed but may need a higher wattage dimmer than the total wattage of the light fitting – a qualified electrician can easily deal with this. Beware if you buy LED lamps for dimming, as you may experience flickering or overheating. This might be a sign that either the lamp isn’t dimmable in the first place, or the dimmer is only capable of dimming lamps from certain manufacturers, so check your bulb is compatible with your switch. Can you install bedroom lighting yourself? If you are on a budget, you might be tempted to install your own lighting, but if you are carrying out any electrical work in your home or garden in England and Wales, you will have to conform to building regulations. This means using an installer who is registered with a competent person scheme to seek approval from a Building Control body. You do not need to tell Building Control about repairs, replacements and maintenance work, extra power or lighting points, or other alterations to existing circuits, unless the work is carried out in a kitchen or bathroom. For more information, read our building regulations explained feature. You can find more information on the Government’s planning portal planningportal.gov.uk, too.